Reaching new depths of terror in fanediting! The intention of this fanedit is quite simply to embrace the “B” movie style nature of the story and ramp it up to another level. 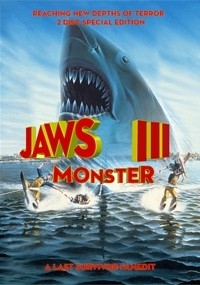 By removing as many of the obvious 3D effects as possible, replacing many of the existing “slow” movements of Bruce III with new shark effects, creating a whole new finale and many more surprises besides, hopefully Jaws III Monster will act as a fittingly monstrous disaster tribute to a much maligned cult classic. Enjoy. Special thanks to Sophie Payne, Bionic Bob, TMBTM, Blueyoda, and Romain Christmann. Without all your help, this edit would simply not have been possible. - Removed scene where the Sea world water-ski team “pyramid” collapses and the shark fin is then seen nearby. - Moved the attack on Shelby Overman to slightly later in the edit. New shark effects added. Also cut the 3-D shot of Overman’s floating severed arm after he is attacked. - Have slightly trimmed and recut the sequences involving Mike & Kathryn and Sean & Kelly after they leave the bar – intercut then more with the sequences of the two would-be coral thieves which have also been trimmed. - Added Cheap Trick’s “I Can’t Take it” as background music as Mike, Kathryn and Sean have breakfast. - Submersible search for Shelby Overman substantially trimmed. Removed as many of the poor 3D effects as possible. - Shark chase scene trimmed. Shots of the real shark footage have been reduced as Mike and Kathryn escape the jaws of baby shark, thanks to the dolphins Cindy and Sandy. Also shortened scene of the shark crashing into the wreck of the Spanish Galleon, meaning we no longer see the inside mechanics of the shark come forward into view through its mouth. - Cut Calvin, Fitzroyce and Jack having dinner. - Needle spraying into camera 3D effect trimmed as Danny prepares tranquilizer for Kathryn to use against the baby shark. - As Shelby’s body floats into view through the portholes of the underwater tunnels, removed the part where the girl is pressed up against the porthole by some idiot behind her. - Mother shark gets through the shark buble screen – new shark effects added. - As Kathryn goes diving to help Mike as he’s welding the underwater tunnels together, some new effects have been added. - Sequence where Mother chasing Mike and Kathryn, and the dolphins attacking Mother has been severely trimmed and altered to create a new finale. - Entire sequence where Mother crashes through the control room and then she is eventually blown up, now removed. - Super imposed shot of the dolphins as the movie ends has now been removed. The rest of the Video Diaries can be seen here. Really enjoyable movie. It's been years since seeing the original and I'd forgotten the majority of it. I definitely don't remember it being this fun. My overall impression of the original was that it was mind-numbingly boring, actually. There are still sections here which aren't that interesting, thanks to the original script, but these are usually helped along by a fun turn from Dennis Quaid. It's easier to scoot by those bits when the film's been tightened up this much, too. I really enjoyed the additions from other films to pep this one up. They worked really well, didn't stand out too much (apart from maybe a couple of obvious CGI shots which were nevertheless graded and colour-corrected well enough to not jar with original footage) and added a lot of fun stuff. The only thing that I wasn't keen on was the radio DJ providing plot exposition. I assumed (even before watching the brilliant documentary on disc 2) that this was the fan editor right away. It really sticks out in the final scenes, too. In theory, it's a fantastic idea, but the performance doesn't work for me. The key sticking point is the British accent. It doesn't work given the setting and the inherent Americanness of the film. Other than that, the additions are amazing. Frankly, I didn't realise the extent of some of the editing until I saw the documentary, which is a testament to how well it's done. The editor has taken a forgettable, dated chore of a sequel and turned it into a fun movie. I'll be recommending this one to friends. The extras are fantastic as well. Great touch. This was an outstanding fan edit and very professional in it's overall presentation. The extra's on disc two were top draw. Most of the new footage and shark effects were integrated well. I particularly liked when the squid first surfaces further enhanced with an excellent music cue. The ending is a huge improvement over the original and the same can be said about the rest of the film. Only thing that didn't work for me was the opening credits montage which featured way too many CGI sharks for my taste and simply went on too long. Personally I prefer the underwater shots as used in the originals where it's left to the music to set the scene and nothing is shown. The video quality wasn't particularly good however I believe this was mostly a result of the source material. In any case the new footage was downgraded to match perfectly. Overall this edit is highly recommended and deserves all the accolades it's received! A definite improvement on a really bad movie. Like the new B movie elements added with the new squid ending. Thank God for the removal of the tacky 3d effects of the original. Excellent soundtrack. Love the extras on the second disk... Love the "Ghost Shark" short. Fun edit! Given my lack of knowledge to Jaws 3 I didn't take a look at the changes Last Survivor made but knew the edit would include a new monster and remove some dated 3D effects. After seeing the edit it was hard to see just what else he had done to this film. This is the biggest complement I can give to the editor as the commentary goes into great detail the various changes made I just presumed this to be how the film was originally released. The added Squid monster fits in perfectly though maybe a bit of back story to the monster would have made for a stronger sub-plot. However seeing the footage on the deleted scenes I think the right de-session was made as it's clear that both films have some years between them. The film it self is a enjoyable B movie flick, a little more family friendly than it's predecessors but it's well acted and the characters are likable. 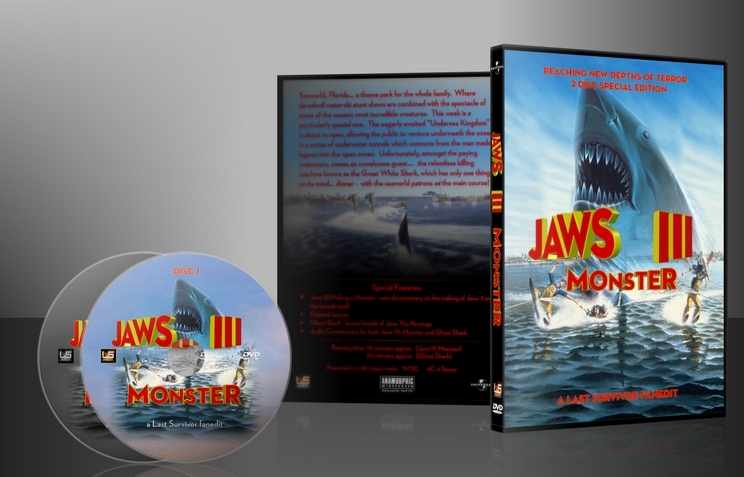 The bonus feature includes a great documentary with narration by Last Survivor in which we see some interesting ideas / stories regarding Jaws 3. Last Survivor also explains why he wanted to edit the film which is very insightful and I’d recommend to anyone who is just starting out or thinking about becoming a fan editor. The Ghost Shark short film is another welcome inclusion, as with Jaws 3 I haven't seen Jaws 4 in over 20 years but I’m well aware of what people's opinion on the film is. Last Survivor is able to salvage something from the film and turn it in to something watch-able and it looks great in black and white. As with the main feature another entertaining commentary is well worth checking out. Now that I have Jaws 3 and 4 will I be watching these films in the future? Simple answer to that is NO. why would I when I can just re-watch Jaws 3: Monster. The only criticism against the edit is that maybe you don't get the shear size of the shark given that footage was removed. The only problem I see with this edit is that its intention is a little vague – most of the 3D is fixed, and the ending is changed, but it’s still corny and stupid; however, I can’t say it isn’t entertaining. Technical quality – 9/10 – well, the video quality was very poor, full of grain and blocky solids, but I’m pretty sure this was the fault of the original DVD and not LS. Editing – 10/10 – the color correction, for the most part, was very nicely done. Presentation – 10/10 – oh. My. Gosh. The extras. Ghost Shark was BRILLIANT. It didn’t have a real clear story progression, but it was still brilliant. It was entertaining and emotionally engrossing. It may have been better if the end was more ambiguous, and if Ellen had somehow confronted the shark in her own mind and overcome her fear or something. But, man oh man, that build-up of paranoia and what’s-real-what’s-not was incredible. Then there was a set of interesting deleted scenes and a MAGNIFICENT documentary. Cannot recommend that enough, it probably is one of my favorite parts of the edit. LS, you did a splendid job keeping the docu entertaining and informative. I never got bored, I learned a lot, and it was a really fun watch. I wanted to get this review posted soon, so I didn’t listen to the commentaries yet, but I have no doubt that they will be splendid. The cover art left just a tiny bit to be desired, but I won’t go into that in a review of the edit itself. Menus were very nice (great that you had scene selection even for the extras). Entertainment – 8/10 – I never really finished watching Jaws 3. I watched about half of it and then never really got back to it. This time, I sat down and watched LS’s edit in one sitting without really getting bored at all. The opening flowed nicely, but the fact that it was in Amity and completely unrelated to the rest of the movie seemed kind of weird. Personally, I think the title sequence gave too much shark away – I guess you were trying to capitalize on the B-movie feel, but any and all mystery that could have been retained wasn’t. One of the things LS said was that he was trying to keep the shark’s presence less obvious so early on, and this was completely ruined by showing a huge, over-the-top shark montage during the opening credits. The rest of the film plays like a cheesy Jaws rip-off. I guess my problem with it was that it couldn’t decide whether it wanted to be the next Sharksploitation Edit or whether it actually wanted to improve the film. But either way, it was entertaining, and I completely forgot I was watching a fanedit because the cuts were so smooth. The other problem with it is that it could have done with a few more [SPOILER SPOILER SPOILER] Octopus scenes to build up to that incredibly well-edited and corny B-movie climax that was a nice callback to the end of the Sharksploitation Edit [SPOILERS OVER]. I noticed the repeated octopus scenes, but my mind didn’t really register that they were meant to be part of the plot for some reason. The re-edited attack on the scuba divers was cool, though, and I think this edit can’t really be much better – I mean, the editing is completely perfect, and it really does feel like a very entertaining B-movie. I would give Disc One 8/10 and Disc Two 10/10, so that balances out to 9/10.